Half a century ago, most faith schools offered a pretty rigid form of religious education in which dissent, independent critical thought, etc. from pupils was certainly not encouraged, and was in fact usually suppressed in one way or another. Fashions change. Nowadays, the tendency is to say that of course children should be encouraged to think and question, even when it comes to religion (though this may well immediately be qualified by "But not too early or too much!"). I think many religious schools are in something of a quandry on this point. On the one hand, they want to pay at least lip service to the idea that children should be raised to be autonomous critical thinkers; on the other hand, there's a suspicion that this might erode the faith, and perhaps also lead children into immorality, etc. My view is that we certainly should raise children to be very robust critical thinkers even about morality and religion. It's easy to pay lip service to the idea of free and open discussion and critical thinking, while actually heavily psychologically manipulating people. Would those schools that say they foster independent thought welcome followers of other religions, and also atheists and humanists, into their classrooms to foster robust discussion of the school's religion and raise some challenging questions? I know from personal experience that, in the UK, many religious schools would certainly NOT welcome that, which suggests that, while these schools may say they encourage independent thought and debate, it's actually debate of a very stage-managed kind. Certainly, that there's critical discussion of, say, the Bible is not enough. Go to a Bible reading group and you'll find a lot of critical discussion, but of course it all takes place within the framework of a faith - which is never questioned. The question of whether the faith itself is true just doesn't come up. I think it should come up, in all schools. Am I right? Is that a fair demand? Critical thought should be encouraged. However I am not sure this should be done in the context of "faith" schools. These should not be part of mainstream education at all and you seem to be conceding that it is OK for the to be so, provided that they have some sort of critique of faith as part of the curriculum. It showed a little girl taking a "science" test apparently based on young Earth creationism. Now the program as whole seemed pretty ropey and sensationalist but the thought that someone somewhere in the UK is teaching such manifest twaddle as science is unsettling. No amount of lessons "questioning belief" would make up for this. It is one thing to ask a child "According to the Bible, how old is the Earth?" but to leave out the qualifying phrase and expecting 6000 year to be the correct answer is just plain wrong. Surely it depends upon which schools, and which faith, you are referring to. Critical thinking was offered as an AS level, RE lessons were one of the most relaxed because they tended to involved prolonged class discussions in which anything could be brought up and no view was ridiculed (whether it be Christian or not). RE was essential for my own personal development acutally, from an arrogant little year 7 to a more mature person today. I'm not sure "critical thinking" is really something to be taught in RS, RS is for learning about and from religion. Critical thinking should be used, but the skills required are better taught in history, english and science. I don't think it's fair to lump all "faith schools" together. The Bible was not taught to us as fact, we were not required to read it for class or memorise it (as the Qur'an is encouraged in some Muslim schools). Oh and a note to anonymous, it's a C4 documentary. I wouldn't trust it at all personally! How impartial can any such discussion be though, when according to central beliefs of monotheistic religion there are costs to be paid in disbelief? "sure, discuss freely, question, but if you don't believe, you are going to roast in hell". Unless, of course, hell is interpreted in an alternative fashion as eternal separation from god, or somesuch other less-than-firey damnation. I would add to your call for critical thinking. If it were up to me, I'd want students to learn critical thinking from a skeptical perspective. That is: Accept nothing that you haven't thought through for yourself. It's a lot to ask. But if critical thinking doesn't begin from a foundation of skepticism, what good is it? I believe critical thought is so important in giving children options. But it must be difficult for some families who value religous culture as part of their identity and feel threatened by impacts, such as, californification. So how does one preserve cultural identity while allowing dilution from seductive messages like those produced by Hollywood? "So how does one preserve cultural identity while allowing dilution from seductive messages like those produced by Hollywood?" Aren't you getting Stephen Law confused with Sammo Law? I'm not sure what sammo law is but I do not believe we can ignore that the practice of strict religious teaching in schools is factorial and that we should also think about cultural, social, political and economic influences that manifest strict religious teaching. In "Western" political systems we have the right of choice but only if we teach critical thinking? I could be wrong but it appears hypocritical to me. nigel - perhaps the Sammo Law comment was too obscure - he's an actor. The implication I intended was that I do not believe that Hollywood has mounted a significant philosophical challenge to religious culture. Indeed I actually suspect it has reinforced religious culture in many ways, from the blatant "Its a Wonderful Life", all of the horror flicks where a holy symbol and a bit of faith saves the day through the simple casual acceptance of the supernatural that underlies many film plots. Producers always leave the religious mindset something, witness the stubborn refusal to discount the influences of "greater powers" or "fate" in the closing scenes of many films. I don't think this is just a worry in faith schools. My children are at a state community primary in East London. It is a school where over 40 languages are spoken and most major religions represented. No one ethnic group dominates. They have regular visits from the local vicar and many of the kids go to Madrasa straight from school. My kids will always demand to take in birthday treats which are non-gelatine, know the Jehovah's Witness kids don't celebrate Christmas and are very aware of how many hours some of their friends spend studying the Koran after school. Oh, and this week they had a special assembly for the murdered pet rabbit of one of the teachers where they were encouraged to pray for the rabbits passage to pet heaven. My worry is that they see all these things as normal and to be respected rather than as things to be critically assessed. Education, as I understood it when I was at school and university, seems to have gone by the board completely. Nowadays, the very notion of having their cherished beliefs questioned strikes some people - even so-called teachers - as deeply offensive, as we've seen from many recent instances on Stephen's blog. If this increasingly clueless government really doesn't understand why it is so unpopular, it need look no further than its appalling track record on dumbing down free speech and independent thought in recent years. Dr Law, I don't suppose you managed to see Dispatches the other night? On fundamental Christians in the UK? Seems whilst the press has been focusing on Fundamental Islam the garden fate vicars have slowly been dusting off their pitchforks. Haven't got time to provide the link, but it'll be on the Channel 4 website I'm sure. "Dispatches: In God's Name"
My experience of as a parent at a community (i.e. regular, non religious, state) primary school is similar to anonmymous in East London. The RE syllabus appears designed to discourage critical thinking about religion -- the aim seems to be, above all, to encourage children to respect 'their own religion' and that of others, rather than to help them to develop any kind of skills to think about what they and others believe. The direct relationship between family religious identity and individual children's own beliefs is never questioned, so while the school brings together children from different relgious backgrounds, it does not provide an environment in which they are encouraged to question the religious certainties they learn at home and in sunday school or daily after school mosque sessions. In the classroom teachers seem to skirt away from any questioning of religion, concentrating on the external practise of religion (buildings, celebrations, clothing etc...) rathe than beliefs. In the playground any criticism of religion is interpreted as 'racism'. Vicars, imams and other religious leaders are welcomed into school for ocaisional 'show and tell' sessions, but no body with an atheist perspective. "Show and tell"? Whatever next? Critical thinking should take place in non-religious schools as well. They do not have the framework for this discussion, whereas religious schools have resources for this education and allow students to think critically. 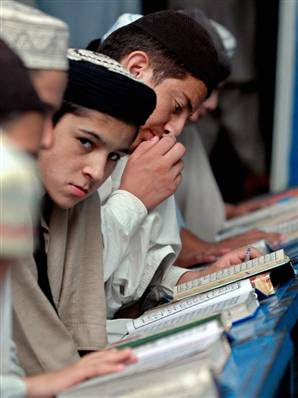 Just because students attend a religious school does not mean that they are brainwashed by teachers ideologies. Rather, teenagers tend to rebel against the adult conceptions and belief.